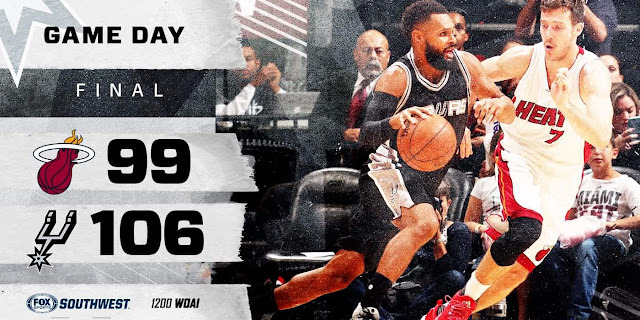 NBA: Spurs vs Miami Heat (106-99). San Antonio spurs would be the first team this season to accomplish four straight wins. 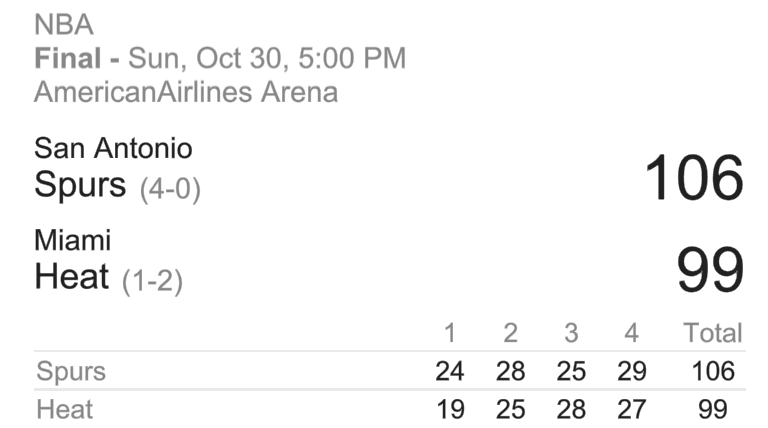 This was the good fight that might have won Friday's home-opening loss to the Charlotte Hornets. But against the San Antonio Spurs, even with LaMarcus Aldridge given the night off, more was required. So even with Hassan Whiteside tying his career high with 27 points and adding 15 rebounds and four blocked shots on a night he left briefly in the fourth quarter with a cramping issue, in the end it added up to an 0-2 start at home and a 106-99 loss Sunday night for the Miami Heat at AmericanAirlines Arena. "It was sort of a better response than the other night," coach Erik Spoelstra said. Kawhi Leonard took charge late for the Spurs, closing with 27 points, supported by 20 from San Antonio center Pau Gasol, as San Antonio improved to 4-0.